This started out as a fun concept. This book did an okay job at explaining basic international politics theories to the uninterested, but I still found it a disappointment. 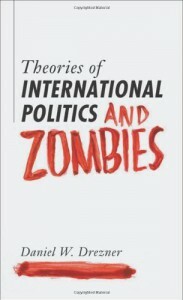 The introduction was promising, but the rest of the book focused too heavily (in my opinion) on zombies in fiction and not enough on international politics. The author should've either made it clear that fiction plays a main role and focus on that, OR take the joke to the next level and focus more seriously on international politics and completely ignore fiction.